RIFT has been the poster child for how to successfully switch subscription models from P2P into F2P. They saw an over 300% rise in the amount of players active on a daily basis and continue to launch content, both in the item shop and in the game for all players to enjoy. The Dendrome’s secrets have been revealed: Inyr’Kta, Hive Queen of the Architects, prepares to unleash titan-forged colossi against the planes! Stopping her requires control of the Infinity Gate, the fateful god engine that first drew the Blood Storm to Telara. Aid Uriel and Kira in their race to open the portal, then leave Telara for the Plane of Earth … and a dire reckoning with the forces that lie beyond. RIFT 2.4 heralds the first chapter in a new war between the elemental planes. Conflict erupts in two new raids plus a new dungeon and Chronicle, all while the Ascended rise to new heights of power with Rank 90 PvP armor, weapons, and more. Prepare for battle with world-breaking constructs – a Planar War awaits! Inyr’Kta has fled to Planebreaker Bastion, a war foundry at the heart of the Architect Empire within the Plane of Earth. There, protected by powerful thralls, she directs the construction of a doomsday automaton. Destroy Inyr’Kta and her towering construct before she can conquer the elemental planes … and our own. Planebreaker Bastion will be unlocked shortly after RIFT 2.4 goes live! As the Ascended rush to control the Infinity Gate, its ancient magic stirs to life and summons furious enemies from the planes beyond. Defeat Breaker X1, Swarm Lord Twins Mordan and Viktus, and a Karthan juggernaut to secure the gate and pave the way to Planebreaker Bastion. A stroke of cosmic unluck has given rise to a nightmarish Realm of the Fae, a dream world where Atrophinius’ deepest fears take on physical form and threaten Telara itself. Chimeric versions of familiar foes now await the Ascended, grinding axes (and teeth and claws) for the twisted battles to come. Read more here! Adventure through an alternate Telara where a victorious Laethys reigns from the depths of her volcanic lair. Sabotage the dragon’s plans for invasion by laying low Maklamos the Scryer, Rusila Dreadblade, and Laethys herself! Ascend to new heights of power with PvP Rank 90 armor and weapons. Unite with Ascended from all realms for adventure on-demand! The Barbershop gets a makeover: Choose from new colors and hairstyles for your character. To preview all of the RIFT 2.4 features and changes, check out the full update patch notes and read the lore behind the Planar War here. The past week or so has been a gamer’s paradise! UMG Atlanta / Arena Gaming League 9 for Black Ops 2. European Gaming League EGL 10 for Black Ops 2. North American StarCraft 2 World Championship League Finals. QuakeCon 2013. SOE Live 2013. Pokemon World Championships. Elder Scrolls Online first gamplay revealed. Dota 2 International. 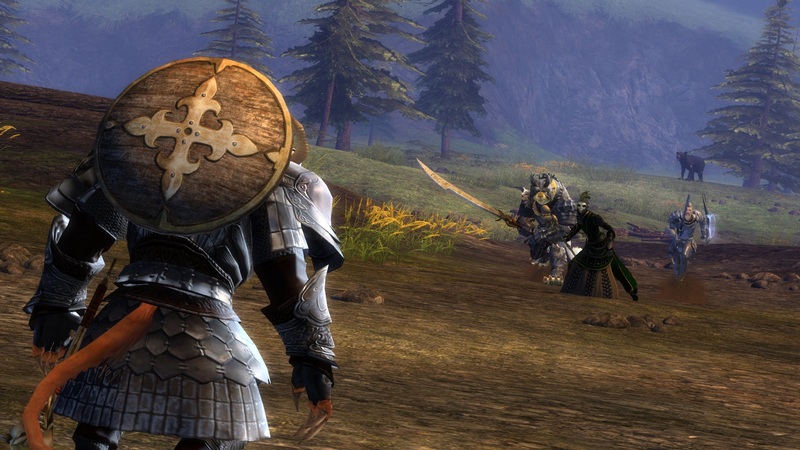 Guild Wars 2 North American and European PVP tournament semi-finals. Black Ops 2 eSniping Tournament. With PAX coming up the end of August, this summer promises to offer the biggest prize money in Major League Gaming history. As I previously posted, Guild Wars 2 is having their PVP tournament finals in Seattle during PAX. Here’s the info they posted for which teams will be battling it out for $10K international prize. This past weekend (August 3-4), we hosted our first Regional Qualifying Tournament in North America, where PvP teams from across the continent competed for a spot in the Invitational Tournament. We’re happy to announce that Lack of a Scrim Feature [SYNC] has secured their place in our first ever Guild Wars 2 Invitational Tournament which takes place during PAX Prime weekend (August 31) in Seattle, WA. We’d like to thank all teams for their participation in the tournament. Congratulations, team Lack of a Scrim Feature [SYNC]—we’ll see you in Seattle! On July 27 and 28, we watched our European community compete in the first Regional Qualifying Tournament. Through a lot of teamwork and discipline, Team Paradigm faced off against Car Crash in a fight to secure their place in our first-ever Guild Wars 2 Invitational Tournament during PAX Prime weekend (August 31) in Seattle, WA. While Team Paradigm won the day, a member of the team was unable to provide proof of residency in an eligible country. This means that Team Paradigm was not fielding a legal team of five players when qualifying. As a result, the second-place team, Car Crash, will be coming to theGuild Wars 2 Invitational Tournament as the representative from the European Qualifying Tournament. We’d like to thank all the teams that participated. Congratulations, Car Crash – we’ll see you in Seattle! Learn more about the tournament right here! Special thanks to our partners MMORPG.com and Mist League for organizing both Regional Qualifying Tournaments. Today, I received an email from the City of Steam devs describing their upcoming 1.3 patch. Unfortunately, I wasn’t able to find any original source on their website, so direct links aren’t available for this post. However, you can go here for their announcements and patch notes after the fact. If you’re not familiar with CoS, it’s a F2P, steampunk-style MMORPG using the lobby mechanic (main cities are essentially lobbies and you move into side dungeons for almost all questing, mostly like Neverwinter). The emailed info is below. Enjoy! Welcome to the Patch 1.3: “Tears of the Oracle” version of the City of Steam News Telegram, in this edition we’re going to tell you all about what you can expect in 1.3, so let’s dive right in! Let’s highlight a few of these additions. We’ve re-added the Channeler class and the goblin, hobbe, orc and dwarf races! With this addition, we’re back to our original 4 classes and 11 races. The new Siege of the Spire event is a 5v5 MOBA style PVP event which we’ve talked about in more detail in this dev journal together with the other events already in the game. The new crafting system “Kiln” will allow for re-rolling of the random properties on equipment; materials for this will be gained by salvaging same quality and level-range equipment as the item you want to re-roll. We’ll go over these changes and much more when the patch 1.3 is actually out, but there’s a lot more to come. Keep an eye on the forums and our Facebook/Twitter where we’ll keep you up to date on maintenance times, length and more additions. So there you have it! Changes are afoot, and we hope you are looking forward to this patch as much as we are. Hope to see you in-game! There have been four hotfixes for RIFT since Empyreal Assault launched last week. However, this hotfix adds two new PVP battleground modes which are a welcomed addition to the game. One is for all levels and the other is a Storm Legion only (levels 50-60) mode. * 2 new Warfront modes have been added! * Available to players between level 10 and level 60. * Fight for the control of The Black Garden by dominating the 2 control points. * Available to players between level 50 and level 60. * Take Karthan Ridge by storm with this 5 control point variant. * Capture Points on your side of the map give 3 points. * Capture points on the enemy’s side of the map give 5 – high risk, high reward! One of the big complaints the Western audience has had about TERA since launch was how far behind the Korean version of the game the Western version is. Apparently this upcoming patch will start closing that gap. A brand new 20-man battleground, major class rebalancing, dungeon changes, and even quicker lower level leveling. Plus a slew of other changes. Take a look at the post by Treeshark. You can bet there will be tons of additional info over the next month as well. Using tanks and cannons to both defend and attack. The attacking team using airships to infiltrate quickly. Its lightweight strength is also its weakness, however, so be wary of incoming cannon fire! A new daily quest added for Corsairs’ Stronghold. Rewards of Bellicarium credits and, for non-max-level players, XP. I’m pretty excited to play this with everyone! Hopefully I won’t get slaughtered too badly, but if our recent twitch streams mean anything, I probably will. This won’t be the only thing coming in our July 2 patch. I’ve talked about decreasing the gap between our release and Korea’s before, and this patch is our first step in this direction. There will be some major changes in the world of TERA with this patch, first and foremost being a slew of class-balance changes that will affect everyone. Yes, even you mystics with your shiny new thralls. Second, the levels, difficulty, and rewards of some dungeons will be changing as well. A lot of the dungeons you’ve seen in earlier levels will be pushed up a few levels, their difficulty and rewards adjusted accordingly. There are more details here than I can provide right now, but we’ll definitely be keeping you posted. Third, the Island of Dawn will be modified to provide you a quicker leveling experience in the early stages of TERA. We’re also making a lot of little changes that will hopefully improve everyone’s quality of life in TERA—starting with a bigger friends list. Finally, a lot of you will notice upon logging in on July 2 that the political system as you know it is no longer active. As you may have guessed from everything else I’ve said, this patch is the prelude to alliances. The most important takeaway from this right now is that the current election ending this Friday, June 14, will also be the last one, so make it count! All the specialty shops will be open in this patch until the alliances arrive in August, when we’ll see the exarchs and the different alliances start controlling the world of TERAin their own way. A patch this big in content is also pretty big in physical size, which is why we’re enabling you to pre-load this patch onto your computer later this month. The instructions and details will be available soon. Now, all this happens in July, but we haven’t forgotten about June! For starters, every weekend starting June 14 will have its own set of challenges, akin to the Four-to-Score challenges we had last month. We’ll randomly choose a set of winners for a new rare prize each weekend. We may also have another twist in store for these challenges, but I’ll save that for later. In summary, the next few months come with a lot of new content, big changes, and fun events to go along with them. We’re really excited about Corsairs’ Stronghold and the new changes coming up for TERA, and we hope you are too! PVP in TERA has been such a contentious issue, even since Korean Open Beta. I think it’s a very smart move to push toward equalized battlegrounds so the “op classes” have less of the mega advantage they’ve had the past two years. 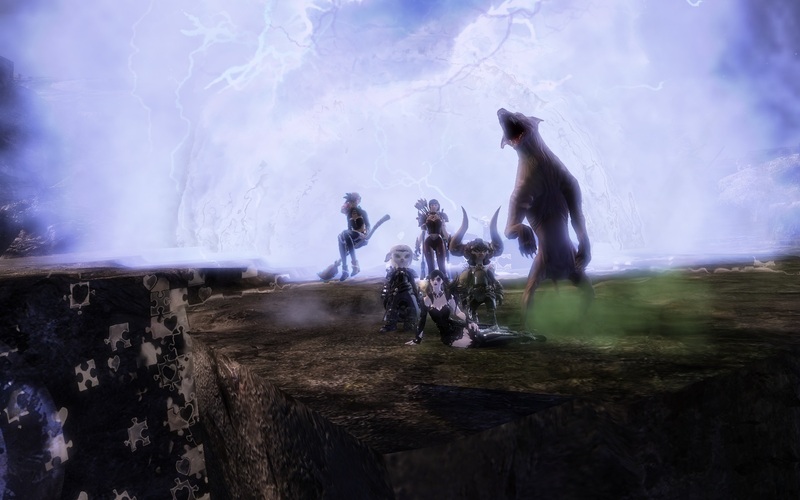 In April, TERA fans flocked to Fraywind Canyon in droves to join in the action—and we noticed. Now we are pleased to announce the return of the equalized battleground, with new team colors for the summer season. To join the action, all you have to do is queue up for PvP by selecting the Fraywind Canyon—Equalized option in the battleground matching system. When you enter, your armor, weapons, and jewelry will automatically be converted to standardized PvP gear, in either black or gold, with the same number of crystal slots and level restrictions as your original gear. Customize your gear, then join in the battle to capture pyres, kill opponents, and reap Bellicarium rewards! The return of equalized battlegrounds is just one of our improvements to TERA. Be sure to check out our latest patch notes for other ways we are working to bring you the best MMO possible! Since launch, there’s been a steady stream of complaints about WvWvW and how zergs rule all, especially in a game where players really don’t have any defined roles (the “trinity” is gone). Looks like ArenaNet’s at least hoping to make some big changes so folks have a lot more fun and spend a lot more time in WvWvW. Take a look below. Greetings! My name is Devon Carver and I’m a designer and the coordinator for the World vs. World team. 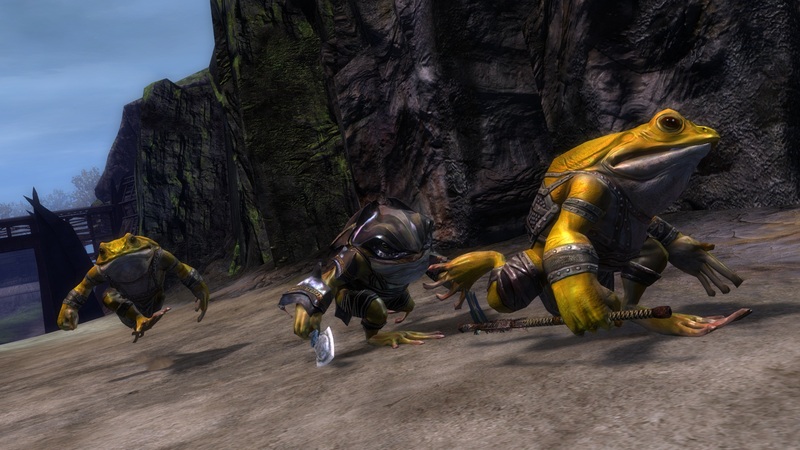 Over the past few months, we’ve started implementing a series of new mechanics and updates to WvW. Some of these have been small changes, some big. For example, you might have noticed that you can now see all of the people rolling over you in a tide of death. We’ve been shifting our focus from major new features to solidifying WvW as it currently exists because while we all love the heck out of it, we know that it still has room for improvement, and we want to continue striving towards making it as good as it can be. To that end, I wanted to provide some insight into what we think about the game and how we hope to continue to make it better. 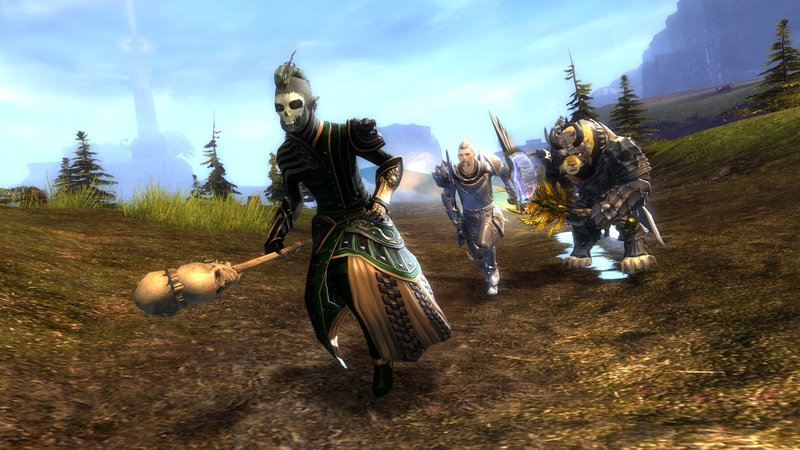 If you’ve logged in to play WvW lately, you’ve seen a game that can be exhilarating and frustrating by turns. Holding a tower against all odds with some smart siege placement and a bit of luck may be one of the most fun things I’ve ever done in a video game. At the same time, feeling overwhelmed by superior numbers with no way to stop them from stomping me into the ground has caused me to turtle up in my keep and weep on more than one occasion. Large groups usually rule the field, and if that large group is rapidly building arrow carts, I’d suggest you get your affairs in order and send a note to your loved ones. World Abilities is a great feature, but it is one that takes a pretty dedicated player to take full advantage of due to the sheer amount of time required to gain significant rank. Support play is vital to victory but unevenly rewarded in terms of World XP, XP, gold, karma, badges, and other tangibles. While those players rebuilding your walls may be performing a vital service, theirs is usually thankless work. Some of the major systems in place currently are not nearly as robust as they could be. Commanders are a major part of the battle, but right now their tools for commanding are few. Guilds are an important part of strategic gameplay as well, but they aren’t rewarded much for taking an active, positive role. These are things we want to improve on because we feel that not only can they increase player investment in the outcome of any particular play session or match, but they simply make the game better for everyone. Finally, we’ve seen that matchups have not been as dynamic as we would like them to be. While it is important to have matchups that don’t feel wildly unbalanced, it’s also good to have some variety in the servers that are matched up against one another so they all get a chance to test their mettle against multiple opponents. That is why we are continuing to evaluate and change the way we create those matchups to inject much-needed variety to the system. All of that may be well and good, but addressing all of those issues is a tremendous undertaking — one that won’t happen overnight. To explain where we are heading, I want to also explain what we want WvW to be. Something that has developed naturally over time and that we would like to encourage is the definition of roles within WvW. Everyone has likely seen a commander laying out battle plans and then subsequently seen that one thief mucking up those plans. It’s our goal to introduce more systems that encourage play within a wide variety of roles, not just those two. Scouts, siege masters, and defenders are only a sampling of the roles we intend to add to. We think that these are all a vital part of the success of any server in WvW, so we want to reward players who do these tasks so that they feel like their time is properly valued. Everyone who plays WvW has encountered the zerg, either as a member or as a victim. The zerg is an important part of the game, but it shouldn’t be the best strategy for victory. An important distinction should be made between large, organized groups of players making strategic strikes and mindless groups of players running around in a mob. The former are deadly and effective. The latter can be deadly at times but tend to be sorely lacking in strategy. Our goal is to continue to encourage organized large groups while giving small, tactical groups the necessary tools to put a dent into larger mobs of less-skilled players. We think that it can be fun to run around in a zerg — but we also think that the game should be about tactical acumen and skill more than sheer numbers. In order to achieve that, we will continue to make tweaks to the scoring system to properly reward smart play and to make it possible for a server to prevail over superior numbers with superior tactics. 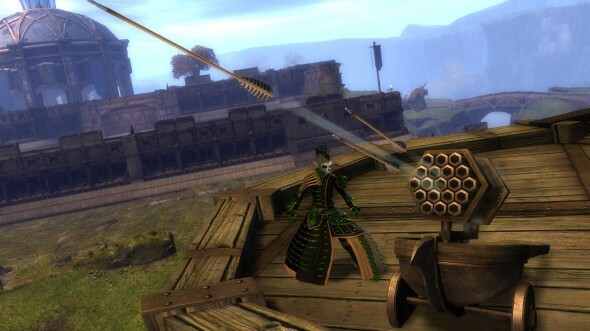 We will also continue to make changes to siege weapons and introduce new siege weaponry to throw the balance in favor of well-organized groups while retaining the joy of jumping right into things for more casual WvW players. One of the things that makes WvW great is the variety of things you experience when you play. Every session has a different story and while your team’ls ultimate objective is the same, the goals of single play sessions can vary greatly. That being said, there is much that can be done to make WvW a much more diverse experience. This starts with the matchups. We are making many changes to not only the way we create the matchups, but to the way we score those matchups. Right now our game rewards you for holding an objective, not necessarily for taking it, and overwhelmingly favors the last server to log out for the day. We have some ideas in the pipeline to try to increase scoring when people are playing the game and to make it much more difficult to keep your territory without actively guarding it. We’ve also been tossing around some ideas to introduce variety into the matches on a weekly basis. Just imagine the possibility of rule changes that come in for a week and then disappear into the Mists. We’ll go into more detail about this in the future, but we think it will be a big boost to players who want to see some more variety. Siege weapons are an integral part of WvW. Not only are they the primary way of capturing and defending objectives, but a well-placed siege weapon can turn the tide of a battle in a heartbeat. Our World Abilities have started adding more to the existing siege weapons, and we’ve made adjustments to the overall balance of siege weapons. We are going to take a much closer look at all of the siege in the game to bring it in line with where we want it to be. Arrow carts should be deadly for players who get caught beneath their hail of arrows, but there should be a viable way to counter them with other siege — we don’t think that “MOAR arrow carts!” should be the answer to every situation. WvW is a mix of players fighting other players and players fighting against the various weapons of war, so we’ll be introducing balance changes that will give you a reason to use every piece of siege at the proper time. This is only a sampling of what we intend to add to WvW. We have a lot of ideas (some crazy, some not) that we hope to release to make WvW an even more vibrant game; a game that will continue to grow and evolve for years to come.